The information to make proteins is stored in an organism’s DNA. Each protein is coded for by a specific section of DNA called a gene. 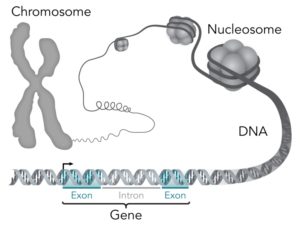 A gene is the section of DNA required to produce one protein. Genes are typically hundreds or thousands of base pairs in length because they code for proteins made of hundreds or thousands of amino acids. Remember that DNA in eukaryotes is found as long linear molecules called chromosomes. Chromosomes are millions of base pairs in length and each contain many, many genes. Some example chromosomes are described in the table below. Figure 1: A karyotype showing the sizes of all the human chromosomes. Notice that they decrease in size. To summarize: many base pairs make up one gene, many genes are found on one chromosome, and many chromosomes can be found in one genome. Previous: 6.1 What are proteins and what do they do? Next: 6.2 How do genes direct the production of proteins?